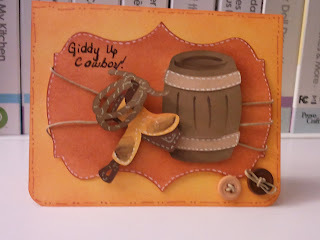 Techniques by Trish: Cricut Card#2 for the week! I'm sorry that this is getting up SOOOO late!!! 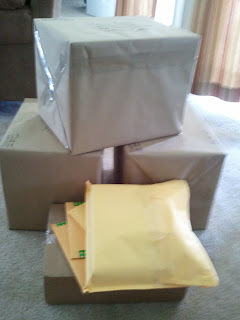 This morning I got up and got together this HUGE bundle for the Post Office. So After getting that all together, I started brainstorming for an order for etsy--I MADE MY FIRST SALE YESTERDAY!!! I was thrilled and than I got special order request :) ANY WHO, I then did some grocery shopping and than decided to finally head to the post office. So my card tonight is 98% made with the Old West Cartridge....the only thing that is not is the top note cut in the background which comes from Storybook. I'm REALLY liking all the cute cuts on this cartridge. I'm not a big fan of the font cartridges because I mostly use stamps but I couldn't help myself with this cartridge because of all the other cuts!! I really hope that you guys enjoy this card!! I think I'll be up late crafting tonight while my hubby is playing his game so hopefully tomorrow's post will be up earlier!! 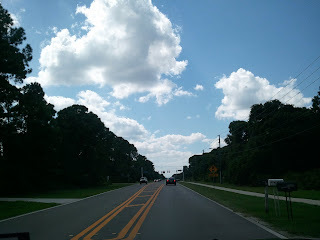 ONE LAST QUESTION FOR YOU ALL: Would you like to see recipes on my blog?? I've been sharing some recipes with Cristi and we think their good....so i was just curious if you guys would like me to share them with you?? LEAVE ME A COMMENT AND LET ME KNOW!!! !